We are sorry about the wrong part. Please write an e-mail to office@cobi.pl with the information what's wrong and with your exact address so that we know where to send the right part. The SuperSpeed set 1926 does not show where to put the stickers for SS1. Booklet for SS2 shows most, but not all. Could you please email me the correct placements for alle stickers? Unfortunately, we don't have any more specific instructions regaring the stickers. To be honest, we have never had any signs that the instruction is not clear in that matter. You may check it with the model on the box. Bought this set for my son. Great set, but it is not possible to determine where some of the stickers go, as there are no instructions regarding the stickers. As Brian states in his comment, it is possible to tell where most of the stickers go from the instruction booklet on SS2, but this only shows the boat from the to sides (no pictures of the top, front or rear). The model on the box doesn´t provide us with answers either. 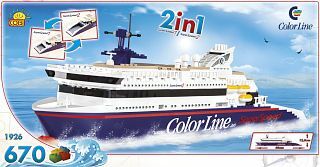 Color Line is a set from which you can build two types of ships, there are different stickers. But generally, it is one set. 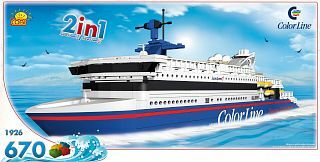 As it was a customised project, you can't buy it anywhere else, only on board of the ship. Merry Christmas for you, too! Color Line SuperSpeed (670) on a color line trip. But it seems that either the manual was missing or he has lost it. manual that I could use to help him build the ship? The instruction manual has been sent to your email address. Thank you for e-mailing me the instruction manual! Hey, this might seem pretty, dum but I dont understand the instructions booklet that comes with this product. The progression over the stages doesnt make sense to me. Any way I could get any help? The set that you have chosen is not the easiest to built, however we haven’t had any signs so far that the instruction is unclear. Please follow each step very carefully and you will surely do it. Is there any particular problem between the stages that makes the instruction difficult to you? This model of ship Color Line SuperSpeed you can only get on board those particular ship. There is a souvenir shop where this kit is available. Hei is it posibel too bay thes ships you have on that site? The stickers should be placed on the sides of the ferry. You can see it at the end of the instruction manual so everything is ok, there's no need for the photos from the top or front. The other sets you are asking about are also available only on board of the cruises. It's the same situation as with the ferry itself.